Periodontal (gum) disease is one of the most common oral health concerns. According to some research, as much 75% of patients over the age of 30 have some form of gum disease. Unfortunately, gum disease is also the leading cause of tooth loss for patients in this demographic, so it’s important that you work with the skilled dentist and team at Framingham Premier Dental to prevent gum disease whenever possible. 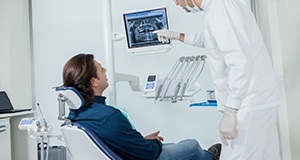 For patients who do experience gum disease that requires periodontal therapy, we offer treatment using state-of-the-art soft tissue laser technologies to deliver painless results. Call our Framingham dentist and team to find out more or schedule an appointment with us. We look forward to seeing you soon. What is Periodontal “Gum” Disease? The word periodontal is actually a combination of two words, perio meaning around and odont meaning tooth. Gum disease refers to the infection or damage of tissues that surround and support teeth. This includes the soft gum tissue as well as supportive alveolar bone tissue. When plaque and tartar builds up at or around the gums, the sticky, acidic biofilms irritate and damage these supportive tissues, leading to numerous oral health concerns and tooth loss in the most severe cases. There are two stages of gum disease. In the early stages, it’s often referred to as gingivitis, and patients may not notice any of the subtle warning signs of this oral health concern. In the advanced stages, known as periodontitis, the disease can be extremely detrimental to oral health. In the early stages of gum disease, we may recommend more frequent professional teeth cleanings and improved at-home care to restore your oral health. When patients are struggling with more severe periodontal disease, we may recommend advanced treatments like scaling (the removal of plaque, tartar, and damaged tissue) and root planing (smoothing of tooth roots to prevent future buildup). Our team often uses innovative laser scaling and root planing to improve the comfort and efficacy of these treatments. Should I Consider Laser Therapies? 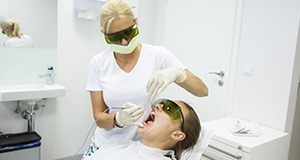 How do I Care for My Smile After Laser Periodontal Therapy? Following periodontal therapy using soft tissue lasers, patients should make a complete recovery within 48 hours. Because the laser cauterizes as it treats, healing is significantly accelerated. Additionally, you should experience little to no bleeding or inflammation. Instead, you’ll see a flawless, healthy smile with minimized risk for infection and better chance to make a full recovery.